To purchase a gift certificate - click the following button. you will be redirected to paypal to begin your purchase! We use PayPal because it is a safe and easy way to accept credit card payments. PayPal keeps your financial information securely encrypted and doesn’t share it with sellers or merchants. Additionally, you don't have to have a PayPal account to make a purchase. 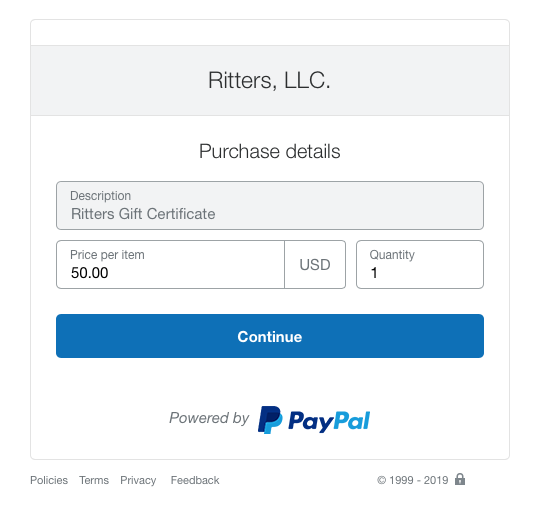 When you click “Buy A Gift Certificate”, it will direct you to PayPal. There, you will enter the amount you would like and hit “Continue”. If you have a PayPal account you can login at this time, or you can check out as a guest and pay with your debit or credit card. From there, all you have to do is fill out your billing and shipping information and hit “Pay Now”! We will mail the Gift Certificates within 1-2 business days! There is a $2.70 fee for every purchase. This covers the transaction fees taken out by PayPal and our costs to mail you your gift certificate. Yes, for example, if you need 3 - $15.00 gift certificates, put $15.00 in for the price and change your quantity to 3! We will mail you 3 separate gift certificates for $15.00 and you will only have to pay one $2.70 fee, as it will only be one transaction. 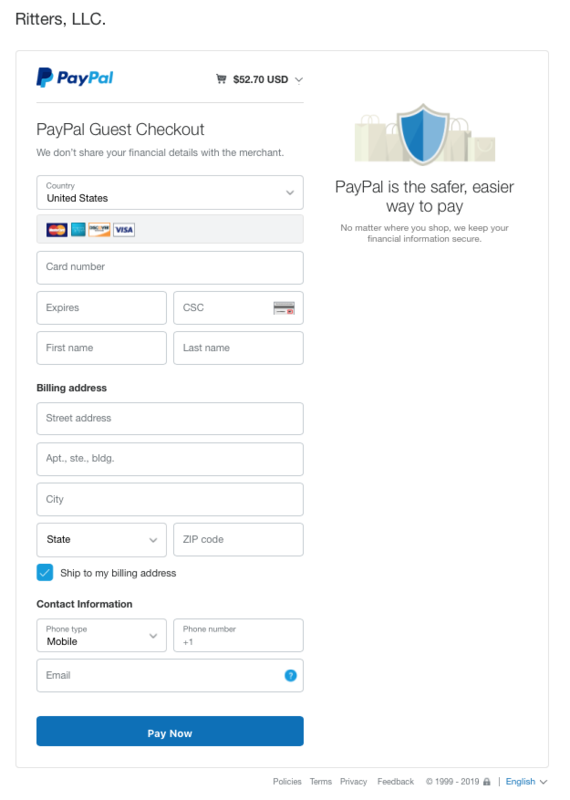 The following is what using PayPal looks like and the steps you’ll take to purchase a gift certificate.